Managing broker licensees must complete continuing education requirements and apply to the Illinois Department of Financial and Professional Regulation (IDFPR) to renew their licenses by April 30, 2015. 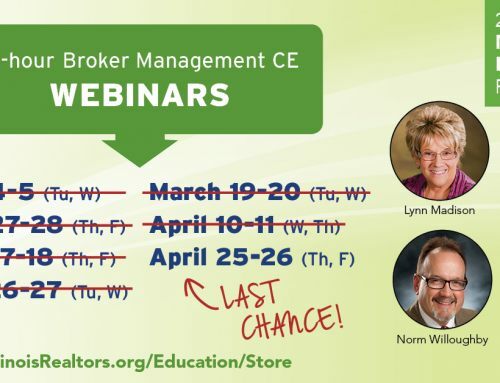 Those who earned their first managing broker license after Feb. 1, 2013 must take 12 hours of regular continuing education courses before April 30, 2015, including six Core hours (one Core A and one Core B course, respectively) and a maximum of six Elective hours. The 12-hour Broker Management CE course is not required. Those who earned their license prior to Feb. 1, 2013 need a total of 24 CE hours by April 30, 2015. They will need 12 hours of regular CE by the deadline, including a minimum of six Core hours (one Core A and one Core B course, respectively) and 12 Elective hours. In addition, they will need 12 hours of Broker Management CE that is only available through a live classroom course or through state-approved live webinars (including those offered by the IAR Licensing and Training Center). Managing brokers first licensed after Feb. 1, 2015 will not need to take CE or renew by April 30, 2015. Check your license for the renewal date. Illinois licensed attorneys are exempt from all CE requirements including Broker Management CE, but they must complete the renewal application by the renewal deadline. Renew your managing broker license electronically through the Illinois Department of Financial and Professional Regulation (IDFPR). Cost to renew on or before the renewal deadline is $200. After April 30, the cost will be $250. Check the IAR Education Lookup – https://www.illinoisrealtors.org/lookup – to review your education credits for courses taken and passed through the IAR Licensing and Training Center. If you took courses through another organization, your CE will not be reflected. You’ll need to contact the other school for those records. For more information, visit the 2015 Managing Broker License Renewal page.